I drew a sharp intake of breath involuntarily when I saw Carnegie Hall ahead, its classic architecture lit up by spotlights against the night sky, the near full moon hanging over 57th Street. This was, after all, the incomparable Carnegie Hall, the site of so much history, including the very first Beatles performance in the United States. It’s the ultimate venue, the place every performing artist wants on his or her resume. And tonight I would be seeing Angelique Kidjo, one of my favorite singers in the world. 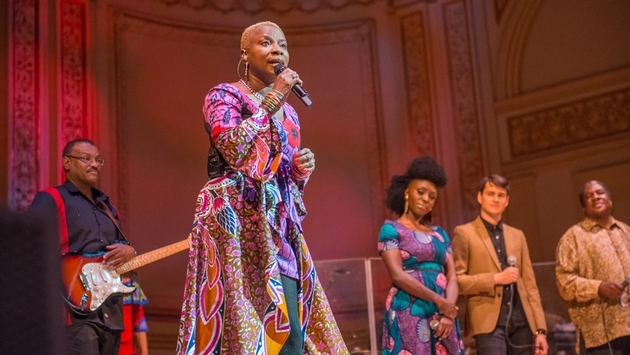 Angelique Kidjo, the singer from Benin, was headlining the final concert in the month-long Carnegie Hall series Ubuntu: Music and Arts of South Africa, which started Friday night, Oct. 10, at Stern Auditorium at Carnegie Hall with a concert featuring Hugh Masekela and Vusi Mahlasela. It’s a series designed to present the culture of South Africa to Americans. The festival was produced by the Carnegie Corp. with support from South African Tourism and South African Airways, among others. The Angelique Kidjo performance was a tribute to the late South African singer Miriam Makeba, with whom Kidjo was an intimate friend. The moment I saw Carnegie Hall looming in front of me was when all the daily workday cares, the scheduling, the navigation of buses and trains in New York City, all evaporated and the actual prospect of seeing Angelique Kidjo in concert dawned on me. When I entered the auditorium, the music had already begun. The majesty of the theater itself was overwhelming, with its monumental neoclassical pillars, its inlaid gold leaf on the fronts of four balconies, rows and rows of heads all facing the stage, and Angelique Kidjo, dressed in a sparkling cape and moving about the stage while she sang, her voice clear and penetrating like a chime. I sat in my seat on the aisle and the driving, syncopated rhythm of the music made it very hard to sit still. Angelique Kidjo’s music has a rhythmic drive that is irresistible. I couldn’t hold still so I allowed by head to move in rhythm and my feet to tap on the floor while I reflected how the stately auditorium was designed for a different kind of listening experience. With all its seats in perfect rows and all of the audience members confined to individual spaces about two-feet square, it seemed obvious that the venue was designed for concerts at which people sat very still and politely as they listened to the performances. Hearing music that made it hard to hold still seemed a bit incongruous with the seating arrangement. No problem, Angelique would take care of that. Angelique Kidjo is one of the world’s most sought after singers now. Everyone wants to sing with her. She’s done duo recordings and performances with Alicia Keys, Joss Stone, Carlos Santana and Peter Gabriel, to name a few. What doesn’t come across on the recordings is the fact that Angelique is an amazing dancer. She’s in a league with James Brown and Michael Jackson with her dexterity of foot movements. She moves as if she were weightless, as if there is a wire holding her up so she can move her feet around any way she wants without having to hold herself up. She moves with astonishing grace and vitality, and it’s just natural, not formal choreography, but just her expression of music through movement as she sings or when the band plays an instrumental passage. She invited the audience to sing along with her on “Hey Mama Hey Mama Africa” and the people present joined in willingly. She pointed to one part of the audience and they sang out and then she pointed to the balcony and they sang out. She urged people to join in and said, “I’m going to check up on you,” and she left the stage and went dancing up the aisle, microphone in hand. The crowd was on its feet, singing, dancing and clapping. She made her way all the way to the first balcony, where Archbishop Desmond Tutu was sitting, and the whole place was dancing with her from their seats. The songs were dedicated to Miriam Makeba and all had some relationship to Makeba that Angelique explained as she introduced each song. She was joined by several friends, including Vusi Mahlasela and some lesser known rising stars. Her band had two drummers, one on an American trap set and one playing African hand drums, and three brightly clad backup singers. It was a tribute not only to Miriam Makeba, but to African music itself. Besides maintaining a rigorous schedule of touring and performance, Kidjo is active in humanitarian causes. She recently delivered the same message on the news show Democracy Now. She’s a UNICEF Good Will Ambassador and an author of several books. Kidjo responded to the comments On Democracy Now. Indeed. I was grateful for the opportunity to cross paths with Angelique, even from a distance.